The abbreviation CNC denotes Computer Numerical Control. Turning is a process where a piece of metal is held in a clamping device and rotates while under power. A cutting tool is brought to the rotating piece of metal and under power travels the desired distance on the piece of metal removing material to make a smaller diameter. CNC turning allows for more versatility over conventional turning by eliminating the need for form tools, some secondary operations and the need to rely on outside sources for additional processes. Employees should start out on a conventional or manual machine to learn the basics. 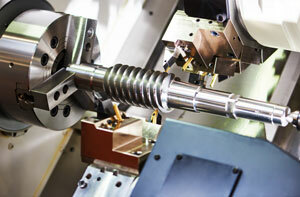 After the basics have been learned it becomes necessary to learn programming for CNC turning and machining. Since programming varies between different machines, an employee will learn more than one system.